Why does Congress refuse to even ask the right questions about Afghanistan? 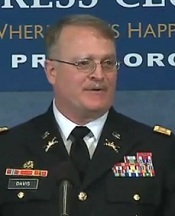 No congressional committee appears the least bit interested in what he has to say, but Army Lt. Col. Daniel L. Davis --who earlier this year decided to blow the whistle on the false and intentionally misleading happy-talk the American public is hearing from the top brass about Afghanistan -- had a chance to speak his mind at a press conference on Thursday, May 31, hosted by bipartisan anti-war Reps. Barbara Lee (D-CA), Walter Jones (R-NC), and others. To the contrary, the views I expressed in that analysis are most assuredly not those of only one person. In fact a considerable body of evidence and published work by numerous and highly credible organizations and individuals comes to the same conclusions. In the limited time I have here today I will share a few of the more profound findings, observations and conclusions from these reports which have direct bearing on the efficacy of our strategy. “They need to address corruption, the steady outflow of capital, the inability to determine what portion of spending is actually spent in – and stays in – Afghanistan. They need to address the fact that narcotics and gray and black economic activity is a major part of the Afghan domestic economy. They need to stop making absurdly optimistic assumptions about the ‘New Silk Road’, future domestic revenues and exports, and the other techniques being used to promise progress that cannot happen. “In their public assessments, both the US-dominated ISAF and the international community suggest that the transition process is on the right path. 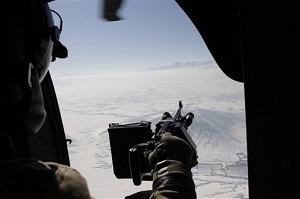 Their assessments, however, are characterized by calculated optimism and based on unfounded assumptions, such as their anticipation that the Taliban will participate in constructive talks. An unprejudiced analysis, in context, gives us little reason to conclude that the preconditions for a positive trend – for instance a cessation of asymmetric warfare and a transition to more effective governance – will be fulfilled in the medium term." It is crucial to note that all the above statements, reports, and analyses have been produced not by some propaganda arm of the Taliban – but by people on our side. They want us to succeed as much, and in some cases more, than we do. How can it be then that with such an unbridgeable gulf between official statements and the large and growing body of work that comes to a very different conclusion, Congress refuses to even ask the questions? Though some of the Members in this room have formally and informally requested of Congressional leadership to hold formal hearings, to date their requests have been met with silence. How could it be that not one of the estimated 250 Committees and sub-committees in both the House and Senate finds it of sufficient importance even to hold a hearing into the matter? The implications couldn’t be greater. If the vast and diverse body of work I have included here is right, our official policy will not only fail to accomplish our national objectives, it may perversely contribute to its failure. Of greater concern to me personally, however is this: the men and women of our Armed Forces will pay with their lives, their body parts, their flesh and blood, and suffer continued degradation to their emotional and psychological well-being in pursuit of a strategy that will not benefit our country. With all appropriate respect and honor to this body, I must again ask: how could it be that not one committee or sub-committee chairman or chairwoman in the entire United States Congress finds the matter of sufficient importance that they will take action to ascertain the truth? So many in America say with enthusiasm that “we support our troops!” Yet when faced with a mountain of evidence that the lives of those very troops are being spent in support of a strategy that has failed, is failing, and analysis suggests will end in failure, no one is demanding that the divergent views be reconciled. If we genuinely value the lives and sacrifice the Members of our Armed Forces make for all of America, I contend their service deserves having these questions answered. I've had this thought for so long now, but it makes much more sense than what we are doing. Change the system, send all the convicted criminals in prisons to war, keep all of the men who aren't already screwed up home. To raise their families without being so far away, and re-building the USA. Send the ones who already gave up their freedom by committing terrible crimes. They don't want to be with their families, or be contributing members of society.. Why feed them on our dime for sitting around rotting and messing up the legal system. Don't take a good man for the so called necessary action of war(s), we need them here. The bad ones can fight for their freedom instead.